Music Together® is an internationally recognized music program for children from birth through age 7—and the grownups who love them! Parents, primary caregivers, early childhood professionals—everyone is involved in the educational process. First offered to the public in 1987, Music Together has been a pioneer in the field of early childhood music with truly innovative, high-quality music education and outreach programs that redefine what musical means. The program is research-based, so we know our stuff and we're good at what we do. But we're also down to earth, accessible, and all about having a good time. It's a balance that makes us both serious and fun. What can we say? We're serious about having fun! At Music Together, we understand the importance of music in early childhood—from birth, in fact. Because the truth is, most people are born with enough music aptitude to play in a symphony orchestra when they are adults, if they choose. But first we must learn how to "speak music"—to take the musical instrument we all have, ourselves, developing that musical capacity from a very young age. The sounds we make, our movements, our rhythms—these are the building blocks of music and of early childhood learning. And that's what Music Together is all about. Music is more than instruments and voices. It's more than rhythm and movement. Music is a powerful force that can inspire, create community, and build family bonds. And it can be life-changing to develop our inner music-maker as early as possible. Child development researchers have found that grouping together children of varying ages fosters natural, family-style learning. ​The hallmark of the Music Together program, our Mixed-age Class gives children the environment they need to grow musically while interacting both socially and musically with peers of different ages. Younger children enjoy watching and imitating older ones; older children learn by leading younger ones; and adults are happy because their children can go to class together. And any or all of your child's caregivers—parents, grandparents, nannies—can come share in the experience, both in class and at home. The whole family is welcome! Siblings younger than 8 months, as well as siblings older than age 5 are always FREE. 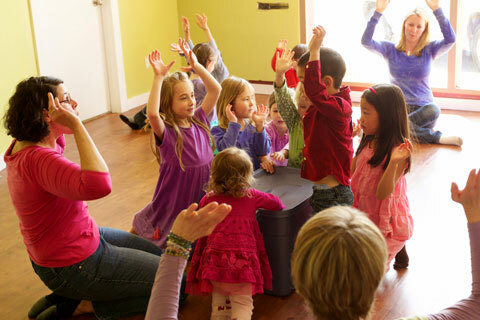 A fully trained, registered Music Together teacher lead groups of six to twelve children and their grownups in forty-five minutes of music and movement experiences. Each weekly class offers a dozen songs and rhythmic rhymes, including finger play, small and large movement activities, and instrument play. Flexible lesson plans give participants opportunities to create and improvise: making up new words to songs, offering movement ideas, making silly sounds, and sharing music ideas from the family's play at home. The research-based curriculum develops music skills; nurtures creativity, self-expression, and confidence; and provides social, emotional, cognitive, and physical developmental benefits. Each of Music Together’s nine song collections contains 25 songs. Our songs are unique, not only for their wide variety of tonalities, meters, and musical styles but also for their outstanding arrangements—which appeal to both children and their grownups. Pitched in the perfect range for children’s early voices, our music collections include a mix of original songs and traditional tunes from a variety of genres and styles, including folk, blues, rock, jazz, classical, and world music. "We started in the winter and absolutely LOVE it!!! Beth is amazing and it is so neat to watch my daughter (18 months) learn new instruments and songs and make new friends. She gets so excited when we sing the songs at home and when she knows we are on our way to class! Today when we were getting in the car after class she kept saying 'again again' because she wanted to go back. Sign up for Beth's class...you won't regret it!" "I have taught in a Montessori preschool and also had my own daycare business for over 20 years, so I consider myself well versed in children and their early childhood education.This program is SO enriching for little ones, I can't believe I found a class of this caliber. I will continue to take my granddaughter for years, I have as much fun as her." ​An avid traveler and musician, Beth Beane has spent her entire career working with young children in the U.S. and overseas. After earning a B.A. in Early Childhood Education from Miami University, she worked for many years with families of children with special needs aged birth to three at Riverside of Miami County, Board of MRDD. Beth then spent a year in Indonesia teaching preschool and managing the infant toddler-program at Semarang International School before joining The Overfield School as a teacher in the spring of 2012. She gives piano lessons to dozens of children and is a licensed Music Together Instructor. For more information about Beth, visit Beth's Music Studio Facebook page. 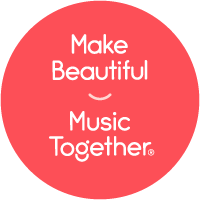 ​​Music Together® art & logo design copyright ©1992–2018 Music Together LLC. Music Together is a registered trademark. Beth's Music Studio is licensed by Music Together LLC. For more Music Together locations: www.musictogether.com.